This program is an alternative to haneWin NFS Server. FreeNFS is freeware. 2.) Launch the program (Run As Administrator) and go to its settings and enter in the path of the root folder that you want to share. In my case, the root path is "D:\" without the quotes. 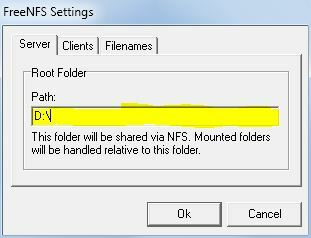 If you're using only one drive to setup your NFS shares, then go to Step 7. 3.) If you're going to use an additional hard drive(s) to setup your NFS shares, then the root path entered in Step 2 must be located in an NTFS formatted drive. Now create 2 empty folders for each drive you want to link at the root of the path shared with FreeNFS. In my case my additional drives called "Drive-E" and "Drive-F" will have folders on the root path called "D:\NewDrive1\Drive-E", "D:\NewDrive2\Drive-F" -OR- you can create 1 folder for each drive you want to link at any pre-existing folder inside the root so it would look like this: "D:\Movies\Drive-G", "D:\TV\Documentaries\Drive-H" and so on. 5.) Now, click "Add," tick "Mount in the following empty NTFS folder," and then either type the path to the empty folder you created on an NTFS drive from step 3 or click Browse to locate it, and then click OK.
At this point you should already have a new folder(s) (or old folder(s)) located somewhere inside the root path you entered in Step 2. If you did steps 3-5 correctly this new folder is now the drive you just mounted. (i.e., "D:\NewDrive1\Drive-E" is your mounted drive.) 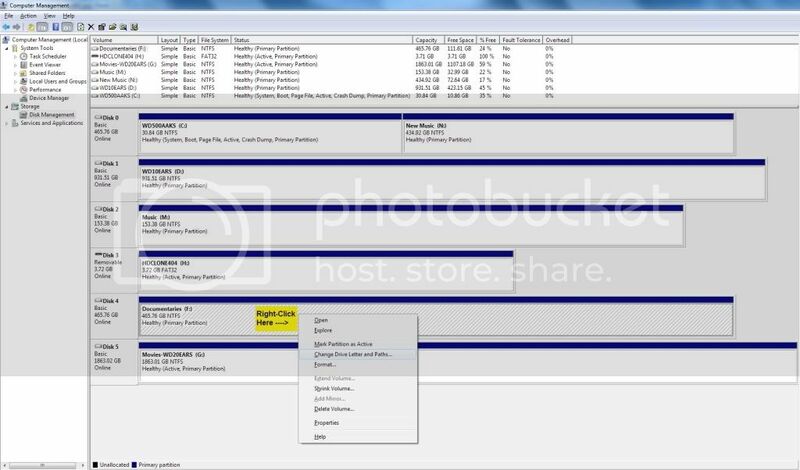 Navigate to this "mounted folder" and be sure you have access to the mounted drive from that location. 6.) Set up your xmounts in WDLXTV Webend config menu. The source of your xmounts should be folders located inside the path you had entered in step 2. Example1: "D:\Movies" is a folder inside my root path "D:\" which should be "xmount 192.168.1.12:/Movies Movies nfs" Example2: "D:\TV\Documentaries" is another folder inside my root path "D:\" which should be "xmount 192.168.1.12:/TV/Documentaries Documentaries nfs"
As for sharing the "mounted folder" that you created and mounted in steps 3-5, you will set up an xmount for the path containing this "mounted folder" instead of the "mounted folder" itself or else it will not work, at least it didn't for me. Example1: "D:\NewDrive1\Drive-E" is a "mounted folder" inside my root path "D:\" which should be "xmount 192.168.1.12:/NewDrive1 NewDrive1 nfs"
Example2: "D:\NewDrive2\Drive-F" is another "mounted folder" inside my root path "D:\" which should be "xmount 192.168.1.12:/NewDrive2 Drive-F nfs"
Example3: "D:\Movies\Drive-G" is a "mounted folder" inside my root path "D:\" which should be "xmount 192.168.1.12:/Movies Movies nfs"
Example4: "D:\TV\Documentaries\Drive-H" is a "mounted folder" inside my root path "D:\" which should be "xmount 192.168.1.12:/TV/Documentaries Documentaries nfs"
You're done! Step 7 is for only if you're using one drive to share. 7.) Set up your xmounts in WDLXTV Webend config menu. The source of your xmounts should be folders located inside the path you had entered in step 2. "D:\Movies" is a folder inside my root path "D:\" which should be "xmount 192.168.1.12:/Movies Movies nfs"
"D:\TV\Documentaries" is another folder inside my root path "D:\" which should be "xmount 192.168.1.12:/TV/Documentaries Documentaries nfs"
This page was last modified on 9 September 2012, at 23:36.